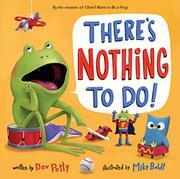 Petty and Boldt’s young frog often has plenty to gripe about (I Don’t Want to Be Big, 2016, etc. ); this time, he is bored. It is a whine that no caregiver can ever escape: “There’s nothing to do!” A bespectacled older frog asks, “You can’t think of anything?” Full of childhood angst—sprawled out on the floor in despair—the small frog answers, “I can think of lots of things… / buuuuut I don’t want to do any of them.” After naysaying all possibilities, even the ever popular “then clean your room,” the frog decides to ask some friends for advice. Rabbit really likes to hop in circles and then stare into space. Cat suggests licking in between toes, and Owl thinks sleeping is the best idea. Pig helpfully unfurls a list of “Pig’s Fantastic List of Things to Do When He Doesn’t Know What to Do.” Unfortunately, nothing on the list is very fantastic. Boldt’s putty-mouthed frog is the picture of boredom and dejection, finally brightening at the yogic realization that sometimes doing nothing, just being in the moment, is better than anything. This is a lesson well-learned, except when school is the next day and the young frog happily wants to do…nothing (oops).